soy candles. pure. sustainable. made in USA. Our Soy candles help create cleaner air one candle at a time! You will love Maddison Avenue 100% soy candles because they are made with GMM-free, organic, US farmed soybean wax and cotton wicks. We offer the purest soy candles you can find! We infuse essential oils and premium fragrance oils for the perfect aromas. 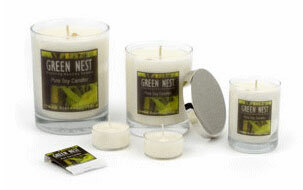 Soy candles are the good consumer choice for green candles - made from 100% vegetable wax that won't pollute your air! Soy candles are eco-friendly, clean burning, and best of all, made from a renewable resource! The perfect complement to a healthy and environmentally conscious home! We wholesale and private label all of our products! Each soy candle is made in the USA and is carefully hand-poured, hand-cleaned and hand-labeled with cotton wicks and a real soybean on the top to remind you it's a 100% soy candle. Our factory is 100% sustainable and each product is custom made to order. Our candles are dye-free and do not have any added chemicals, thus burning cleaner and with less soot. In addition, our soy candles help support the American Farmers! (How cool is that?) We are very particular about our scents too. If we don't like them - we don't buy them. We have hand-picked over 120 premium fragrance blends and essential oils to create aromas that rock! We offer our products at wholesale prices and with private labels to set your company apart from your competition. Our soy candles are best known for their empowering aromas from the top to the bottom. We want every candle made in our factory to produce a soothing aroma that invokes relaxing and peaceful energy. We make the original soy candle fresh and with a real soybean on the top to remind you that you're burning a pure soy candle. The goal at maddisonavenue.com is to create cleaner air one soy candle at a time! Yes, they certainly do. When you burn your soy candle for the first time, it is important to remember that it has a memory. Please be sure to burn it long enough for the wax to be fully melted across the width of the candle. A full melt pool on the first burn will ensure an even burn in subsequent burns and avoid the wax "tunneling". This will allow your candle to get a full melt pool, thus increasing the scent throw. A correct burn releases the maximum fragrance (and that's what you want)! Our 100% vegetable, made with pure soybean oil, wax is FREE from pesticides, herbicides and genetically modified material. It is kosher certified, biodegradable, sustainable and is not tested on animals. Every pound is analyzed in a state of the art laboratory to assure its quality, and doesn't leave the plant until receiving a Certificate of Analysis. Once a wholesale member with Maddison Avenue, we can create wholesale soy candles for your company! We make premium quality (the best) 100% soy candles with your exclusive business name and logo (or purchase without any labels). We'll put it all together and ship them directly to you - ready to sell as your very own line of soy candles. How easy is that? You can proudly display your logo on our products knowing with 100% certainty that they will always be made with high quality products! Make Maddison Avenue your soy candle supplier! Start promoting your company today. We believe in the power of private Labeling / branding and we believe in YOU! With private labels you create a visual image that encapsulates a perceived value associated with your company. As competition intensifies, small business owners are realizing the power of private labels as an ingenious business strategy. It’s not only an alluring marketing and sales tool, it makes good small business sense.